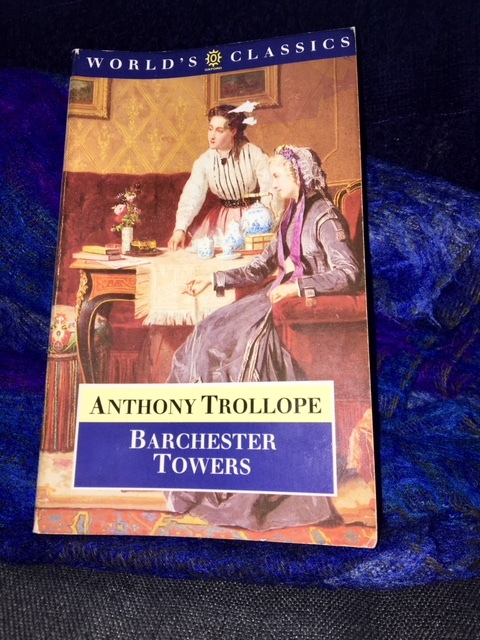 First published in 1857, Barchester Towers is the second of the six Chronicles of Barsetshire series of novels. It picks up the story that The Warden related (1855), concerning Septimus Harding’s renunciation of the wardenship of Hiram’s charitable hospital for old men, and the forces of opposing factions that pressed him into that course of (in)action, or urged him to stay on. My Oxford World’s Classics paperback has a blemish where the charity shop sticker was peeled off; the illustration is a detail from ‘The Suitor’ by Jean Carolus. Oddly, the figure of the suitor has been cropped out. This second novel picks up the thread four years on. As I’m about to travel for a few days, I don’t have time to say much about it here, so shall limit myself to a general introductory post. First: it’s a far superior novel to The Warden, which I found morally dubious, even though the story itself was entertainingly told. It’s more than twice as long, and has a wider, more interesting range of characters, some familiar, some new. The morality is now handled with much less clumsiness. There’s so much to say about the novel I may have to do a few posts to do it justice. I’ll focus here on the opening chapter, ‘Who will be the new bishop?’ – the first of many such questions (ultimately, moral dilemmas) the narrative poses. Archdeacon Grantly, the high church stalwart who’d always been strongly opposed to Harding’s resignation (in all senses of that word), is sitting by his father the bishop’s deathbed. His is the first of a number of those moral dilemmas the novel portrays. The outgoing government administration is ‘well understood’ to favour the son’s succession to the mitre, and the local rumour machine has ‘whispered’ a similar opinion (there were similar whispers and rumours aplenty in The Warden). In many respects this is an improved reprise of that novel – Trollope seems to have realised where he went wrong. and then at last dared to ask himself whether he really longed for his father’s death./The effort was a salutary one, and the question was answered in a moment. The proud, wishful, worldly man, sank on his knees by the bedside, and taking the bishop’s hand within his own, prayed eagerly that his sins might be forgiven him. Trollope excels at showing conflicting traits and impulses in his characters, especially at crucial moments like this. Grantly had been presented in The Warden (as I attempted to show in my posts on it) as too worldly and ambitious, so that he bullies those who dare oppose him, like meek, warm-hearted Harding. Here he shows a potential for generosity and, almost, love. He’s not an out and out villain – he will appear a few chapters later. But just as we warm slightly to this brittle, morally compromised man, Trollope shifts the ground again: the bishop dies, and he needs to get a telegram off immediately if the PM is to be notified and able to make his decision about a replacement before he goes out of office. How to do this without seeming indecently hasty? ‘Now that life was done, minutes were too precious to be lost…useless to lose perhaps everything for the pretence of a foolish sentiment.’ That sympathy Trollope had gently adduced for Grantly begins to wane. But how was he to act while his father-in-law stood there holding his hand? how, without appearing unfeeling, was he to forget his father the bishop – to overlook what he had lost, and think only of what he might possibly gain? Grantly writes the telegram himself and gets Harding to send it under his own name – so he doesn’t seem too importunate. Harding is surprised to find Grantly, ‘as he thought, so much affected,’ but reluctantly complies. What’s so satisfying in this scene, and the novel, is Trollope’s adept manipulation of his readers’ responses. We’re coaxed into feeling for Grantly, then let down with a bump as his stronger impulse triumphs over filial love. Look too at that sly aside as Harding surveys his son-in-law’s apparent grief: ‘as he thought’. Our narrator knows more, and hints at it. With such censures I cannot profess that I completely agree…A lawyer does not sin in seeking to be a judge…A young diplomate [sic] [is ambitious]…and a poor novelist when he attempts to rival Dickens or rise above Fitzjeames, commits no fault, though he may be foolish…If we look to our clergymen to be more than men, we shall probably teach ourselves to think that they are less, and can hardly hope to raise the character of the pastor by denying to him the right to entertain the aspirations of a man. The irony is double-edged. He is censuring Grantly for his vaulting ambition, but acknowledges that he’s a flawed individual, not a representative of the clergy – this is Trollope’s principle; groups cannot be universally judged on the flaws or merits of individual representatives. Our archdeacon was worldly – who among us is not so? He was ambitious – who among us is ashamed to own ‘that last infirmity of noble minds’? He was avaricious, my readers will say. No – it was not for love of lucre that he wished to be Bishop of Barchester. [He would be rich without it]…But he certainly did desire to play first fiddle; he did desire to sit in full lawn sleeves among the peers of the realm; and he did desire, if the truth must out, to be called ‘My Lord’ by his reverend brethren. But these hopes, ‘were they innocent or sinful’, were not ‘fated to be realized’. The rhetorical symmetries in that passage are perhaps a little heavy-handed; a greater writer would have done this more subtly. Trollope may not be too interested in subtlety; he’s content to weave in and out of the positions we might normally expect of a narrator of a comedy with a moral message and keep unsettling us. Hence that piquant use of the first person plural: he turns the table on the reader, acknowledging Grantly’s venality, but confronting us with our own – and his. In refusing to preach, Trollope’s narrator demonstrates that moral rectitude is rarely straightforward. This entry was posted in English Literature and tagged Anthony Trollope, Barchester Towers, Chronicles of Barsetshire, Oxford World's Classics by Simon Lavery. Bookmark the permalink. I’ve only dipped my toe in the water with Trollope, just a few Christmas-themed stories from a collection of short pieces. They were good — especially the observations on character — but this sounds as if it’s in a whole different league. I’m glad this proved to be more successful for you than The Warden – hopefully this standard will be maintained as you work your way through the series. This is probably his best in the series but the others are all hugely enjoyable. I also have a weakness for The Last Chronicle of Barset and its highly dramatic twist. Trollope was a very good craftsman. His favourite authors were actually George Eliot and Thackeray, not Dickens (he probably thought he was too heavy-handed !). Interesting post Simon, and I must admit I had previously picked up the impression that the sequence didn’t start off with the best book – I guess maybe you have to read The Warden to set the scene for what follows! Look forward to your further thoughts and enjoy your travels! Oh, yes, I remember there was one volume missing from your collection but I couldn’t remember which one. I’m glad you found it because this is an important one in the series, more so than The Small House at Allington, for example. A lovely piece. I was sucked in by The Warden but really hooked by this one, although I love Doctor Thorne, too. If you’re actually “doing” them in an occasional series, do shout when you start the one after Doctor T and I’ll join in. It sounds much better, but I am now rather curious to see how you find the rest of the series. Yes, it is a more mature and well-crafted effort than The Warden, with a richer cast of characters, and some excellent villainy. I have a couple of other things lined up before I tackle vol. 3 – don’t want a Trollope binge.